There are a few simple tips to learn how to use essential oils for their potent healing properties. After learning these guidelines, aromatherapy is an excellent way for us to treat our stress symptoms at home, and to control the long term hazards of chronic stress. There are three main ways to use essential oils: topically, by inhalation, and by ingestion. In this part of the series, we will discuss topical use. When you use essential oils topically, you simply rub them on your body. Take a drop of oil on the palm of your hand, rub your palms together and rub them on your skin. Topical application is very well suited for relieving pain, aches, sore muscles and injuries–in other words, getting the oils to your physical body. The healing molecules in the essential oils permeate the skin and enter the blood stream and bring almost immediate relief. Many sources in aromatherapy will caution that essential oils should not be applied neat, or undiluted, on the skin. This is excellent advice if you are not sure of the quality of your essential oils. Most essential oils are produced for the perfume industry, and this is even true of essential oils from a health food store. They may be adulterated, or extended with chemicals. They may have mixtures of various species of a plant, if the smell is similar. This means that you can not be sure of the purity, the efficacy, or the reliability of the essential oil when using it for its therapeutic benefits. Be sure you trust the source of your oils. If you have any doubts, use them cautiously. Some oils are hot (those high in phenols)–oregano, thyme, cinnamon, clove, lemongrass and bergamot. Do not put them in your eyes, mouth or “tender” skin or they may burn. Even not-so-tender skin may turn red with these hot oils. If an oil turns your skin red, dilute the essential oil with a vegetable oil (like olive oil or almond oil)–not water. Water is used to increase the effects of the oil. Only vegetable oil will reduce the effects of the essential oil. If an oil turns your skin red, it will probably be a detox reaction, not an allergy. Back off. Use less oil and less frequently. If it is a detox, the reaction will gradually become less as your body detoxes. If it is an allergy, the symptoms will stay the same or worsen. Some oils are photosensitive and may cause a rash or darkened skin if used before sun exposure–angelica, bergamot, grapefruit, lemon, orange, tangerine and other citrus oils. Pregnant women should avoid sage, fennel and hyssop. Epileptics and people with high blood pressure should be cautious with high ketone oils like basil, rosemary, sage, hyssop, wintergreen, nutmeg, rosemary, tarragon and tansy. Be aware that children, older people, very sick people or very sensitive people may feel the effects of the oils intensely. Be gentle! A very good safe place to start with topical use is the soles of your feet. The oils absorb well and the skin is not very sensitive. Rub a drop or two of basil or marjoram on your sore muscles. Put a drop of peppermint on the base or your skull or on your temples to relieve a headache. Rub some fennel or peppermint on your belly to relieve a stomachache. When your immune system is depleted and you have a fever from the flu, rub some peppermint on the soles of your feet to bring your temperature down. Rub some eucalyptus or RC on your chest to relieve congestion, and support your immune system. Rub some RutaVaLA blend on the soles of your feet to bring your parasympathetic nervous system back into balance. Using essential oils topically gives excellent support to our tired, stressed bodies. To learn how to use essential oils completely, the next part of our series discusses inhalation. Inhalation provides deep emotional balance to regain our prospective, and regain our more easy-going nature. Need a great stress relief tool? Try using essential oil. Use them everyday and they will revive your spirit, replenish your body, and even balance your hormones. Their potent plant medicine works to relax your physical body, calm your emotions and lift your spirit. Essential oils can be used many ways. It is easy and quite beneficial to begin casually, using them in our everyday life and with little fretting about the therapeutic benefits of the plants. The plants will support your body, but by using the oils practically, you can avoid the “I don’t know about these things” overwhelm. Thinking about essential oils, or buying them and leaving them on the shelf will not get the desired long-term effects. Even a drop in your bath once in a while is better than nothing. The trick to everyday oil use is to use the oils in your normal daily routines, slipping them into what you already do, or substituting them for other more toxic products. Add a drop of lemon oil to your drinking water. Lemon lifts your mood, and is anti-tumoral, but who needs to know that when your water tastes good? You drink your water like normal, but now it’s better for you. You get the wonderful therapeutic qualities of the oils but don’t need a vast amount of aromatherapy knowledge. You reduce your dependence on other more toxic products. You enjoy the aromas! I have a hard time being morose and stressed when slathering on my favorite oils–they are just too much fun. Put a drop of lemon oil in your drinking water. Put a drop of lavender on a cotton ball and put it in your drawer. Your clothing will smell nice, the lavender will relax you, and the moths and insects will be repelled from your drawer. Diffuse the blend Peace & Calming, lavender or frankincense instead of using a toxic room freshener. Use the blend Purification to repel mosquitoes and other insects. Put a drop of the blend Thieves on your hands to kill germs instead of using a hand sanitizer. Put a drop of lavender on a cloth and throw it in your dryer to freshen your laundry. Put a drop of lemon in your dishwater or dishwasher to cut grease. Spritz the blend Purification to kill mildew, and neutralize cigarette smoke and other odors. Use a drop of lemon to remove the gummy labels from containers. Be careful if the container is plastic–test it first. Use a drop of lemon, oregano, basil, thyme or black pepper in recipes as seasonings. Anyway that you can incorporate essential oil use into your routines will increase your health. Using lemon oil to cut grease in your dishwater will not prevent the lemon molecules from stimulating the limbic part of your brain and lifting your spirits too. When you are ready to focus more specifically on the therapeutic use of essential oils, please find more information at Essential Oil Use: Therapeutics or find out my essential oil recommendations. When using essential oils to banish stress, you take advantage of the essential oil’s unique ability to enter the blood stream and go directly to the emotional center of the brain. There they can reverse the sympathetic nervous system’s stress response and restore a more restful “rest and digest” state. Hormone levels return to normal, the cardiac system slows, digestion regulates and your body can resume its normal functioning. Learn a stress treatment which uses oils daily. Chronic stress involves a cycle of metabolic destruction. 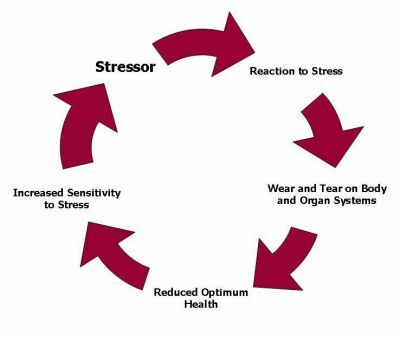 Stressors cause a reaction. A prolonged, major reaction to stress can cause wear and tear on all our body systems and this reduces their overall ability to function. Our weakened condition leads to increased sensitivity to stress and the cycle repeats. This cycle can be interrupted at any point. The most long term solution is to decrease or eliminate stressors. In our modern life, the may not be possible. The next most root solution is to readjust our reaction to stress. Not all stressors are a “red alert” situation. And finally, we can support our bodies so that they are in peak condition to handle what stresses come. Aromatherapy interrupts this cycle in two important ways. Essential oils readjust our reaction to stressors by calming our nerves and clearing our head. And aromatherapy supports out body to maintain its optimum health, regardless of stress. To use essential oils to banish stress, follow this routine of aromatherapy and essential oil enhanced supplements everyday. This routine relieved my stress and even more importantly, restored my sense of well-being. Do these steps everyday and you will feel a subtle, deep blossoming of your inner strength and well-being. Following this list will build a healthier body, a happier and more stable emotional body, and will prepare you to reach your highest potential. Step 1: Put 1 drop of VALOR on the bottoms of your feet and rub it in. If you can’t get to your feet, put the drops on your wrists and hold your wrists together for a few seconds. Notice if you feel any different. Step 2: Put 1 drop of HARMONY on your solar plexus, above the belly button. Step 3: Put 1 drop of JOY over your heart. Take a deep breath and smell the lovely aroma. Step 4: Put 1 drop of WHITE ANGELICA in one hand, rub your hands together and brush over your head, face, chest, shoulders, down the body, as though you are creating an angelic shield-because you are! These four oils balance, uplift and ground. They are excellent for stress relief. Step 5: Drink 1-6 oz. of NINGXIA RED. 1-3 oz is appropriate if you are in good health and are maintaining it. If you are healing, recovering from illness or under a large amount of stress, 4-6 oz. is appropriate. Step 6: Take the Core Supplements as recommended three times daily. Each pack contains the supplements you need for morning, noon and night, and is pre-labeled so it is easy to tell what to take when. The Core Supplements include Longevity, an all essential oil capsule containing thyme, orange, clove and frankincense essential oils. Thyme oil supports brain function and cardiovascular health. Clove oil is a powerful antioxidant, useful for repairing damage caused by stress. Orange has been shown to be anti-tumoral in the laboratory. And Frankincense oil supports cell regeneration and healthy immune function. True Source is an food-based supplement which provides the vitamins and minerals. Because it is food based, your body can easily absorb the nutrients. Omega-Blue is an Omega-3 supplement with essential oils to both keep the omega-3 oil fresh, and to boost the effect of the omega-3. Life 5 is probiotic which builds intestinal health, improves immunity, reduces yeast and increases your energy. Thank you to Vicki Opfer for teaching me this routine. If someone asked for a the single best, easiest treatment for stress–something which would benefit anyone and which uses essential oils to banish stress–Vital Essentials would be the routine. Stress is relieved very effectively by essential oils, and their use by inhalation is especially useful for emotional support. Diffusion and inhalation is the true embodiment of “armatherapie”–the therapy of aromas. There are three main ways to use essential oils: topically, by inhalation, and by ingestion. In this part of the series, we will discuss use by inhalation. Inhaling essential oils is more than just smelling something pleasant. The tiny volatile molecules of healing plants are captured in the oils. These molecules enter our sinus cavities and pass through the membranes, entering the bloodstream near the brain. Some of these compounds, for example sesquiterpenes, have been found to cross the blood-brain barrier and hold promise of bringing healing directly to the brain. There are many types of molecular groups found in essential oils, but give an idea of the complex chemistry and amazing potential of essential oils, let’s just briefly discuss one: sesquiterpenes. The advantage of smelling the oils is that the molecules stimulate the olfactory center of the brain, and this is right next to the limbic center, the part which controls the emotions. I picture these two parts of the brain like neighbors talking over a fence and exchanging gossip–they are very connected. This connection between the olfactory center and the limbic center explains why the scent of fresh baked bread immediately makes us remember grandma or why a certain perfume will recall a particular starry night on the Mediterranean coast. Smells and emotions go hand in hand. This same connection also opens the door to immediate emotional support and stress relief. The healing moleucles go directly where relief is most important. It is important to note that essential oils do not influence just the limbic center of the brain. In fact, essential oils also help balance the hypothalamus, the hormone center of the brain. They enter the blood stream and support whatever body systems are out of balance. They go where needed by the body, reducing the damage caused by chronic stress. The first and easiest way to inhale the oils is to just inhale them. Open the bottle and take a gentle sniff. You can think of waving the aroma of a fine wine near your nose (no snorting please). A gentle waft of scent is excellent for triggering cell receptor sites to awaken your body and its proper functions. The next easiest, and far more potent inhalation method is to put a drop of oil on your hands, rub them together and cup your hands over your nose. The effects of the oils are strong and immediate. Try this with pure, high quality peppermint and your sinuses will be more clear than you have ever experienced. To put oils in the air, we diffuse them. Simple passive diffusion includes putting a drop or two on a cotton ball and putting it in your sock drawer. I keep a pretty bowl near my desk with an oil soaked cotton ball so that every now and again I get a lovely whiff (And by the way, I use a blend called “Abundance” when I’m doing business related tasks!). I put a drop of oil on a terracotta pendant and I smell the aroma during the day. To sleep, I put a drop of lavender on a tissue and put it near my pillow. You can also get a diffuser. The best diffuser for the therapeutic benefits of the oils is a nebulizer, which uses “cold diffusion”. Heat can destroy some of the constituents of the oils, so when I want the oils for healing, I use these. Look for one which sprays the oils in fine drops and whose motor is not too loud and annoying. Hot diffusers can be some of the most lovely, even if they are not the best for the oils. Some styles sit on light bulbs and diffuse with the heat of the bulb. 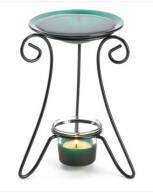 Others come in many styles and shapes and generally use the heat of a small tea candle to heat a bowl of water, into which you have dropped some oil. These are great for baths, your bedroom, or anytime you need a special treat. Take advantage of the link between scents and your memory. Pick a favorite oil, and every time you do a relaxing activity like meditation, reading a favorite book, or petting your cat, diffuse the oil. If you do this repeatedly, that scent will be associated with that activity and its calm restful atmosphere. Then when you need to regain that calm, smell the oil and you will be instantly transported to that state of mind. 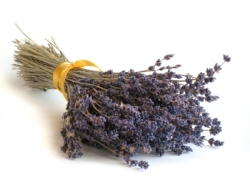 Lavender–This is one of the first oils I grab for stress and relief of its symptoms. This oil calms, soothes, and helps with sleep. You can wear a pendant with this oil and besides feeling better, you will get compliments for smelling good. Frankincense–Frankincense is a very ancient oil which has many, many useful therapeutic benefits. In ancient times, it was used for curing just about everything. I think of this oil as having a sacred scent and use it for meditation. Valerian–Not everyone appreciates the scent of Valerian, but it is excellent for calming the nervous system. Use it for insomnia, anxiety, indigestion, restlessness, and general tension. Peace and Calming Blend–This beautiful blend with a light tangerine scent is both calming and uplifting. I use this as a healthy perfume. Ylang Ylang–Ylang Ylang is very good for balancing hormones, which frequently are whacky from high stress (cortisol levels can create hormone imbalances). I would try Ylang Ylang when your stress increases in rhythm with your cycle. It balances male-female energies, and combats anger. Roman chamomilee–This oil has been used by mothers to calm crying children, so it is excellent when we feel a “stress tantrum” coming on. It is calming and relaxing, good for depression and insomnia. Lemon, Tangerine, Bergamot, Grapefruit (the citrus oils)–All these oils are very good to clear your head and uplift your spirits. Think of a freshly cleaned, sunshine-filled house, and that is the happiness of lemon! Does this list seem too long and daunting? Are you stressed just reading it? An easy solution is to read the list “lightly”, without analyzing it or engaging your brain. See if any oil stand out, attracts you or “just feels right”, regardless if its description seems right. Start with that oil. Remember, in aromatherapy the effects are immediate. If an oil doesn’t do what you want, try another oil. You do not need to keep using an ineffective oil, hoping that its effects will accumulate. Move on. We all have different bodies and what works for one person, may not work for you. In this series on therapeutic use of essential oils, we have discussed how to use essential oils topically, and by inhalation. There remains one more way to use essential oils: ingestion.